Sara Sheffer is observing the feeding behavior of octopus larvae. Her research is made possible by New College's Isermann Medal program. Sheffer is observing three octopuses with the hope of studying the feeding behavior of octopus larvae. But on this day, she was more concerned with helping her subjects, from Mote Marine Laboratory in Sarasota, adapt to their new environment and waiting for the two females to produce the larvae she wants to observe. 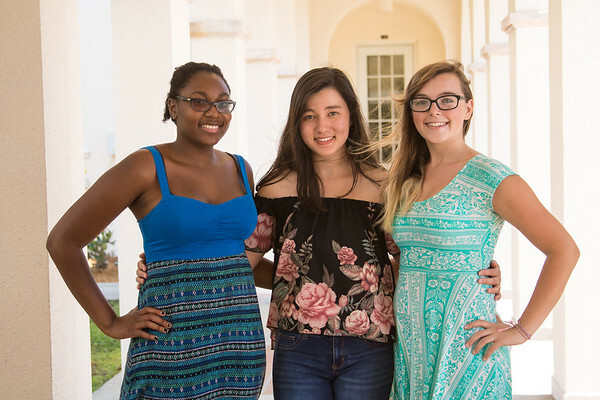 Her research is being made possible by New College’s Isermann Medal program, with provides an opportunity for academically talented first-year students from outside the state of Florida to get hands-on research experience in mathematics and the natural sciences. Sheffer is one of three medal recipients this year. Medalists are paired with a New College professor and participate in research during their first January Interterm period at New College and during four weeks in the summer after their first year. The award includes a summer stipend of $2,500, summer housing for four weeks, a food allowance and funds to purchase laboratory supplies. Sheffer says she’s not exactly sure what she’ll do with the results of her summer work, but likely it will be part of a future ISP or research project. 2017 Isermann Medal winners are, from left, Melissa Simmons, Cassandra Azeredo-Tseng and Sara Sheffer. The other two medalists this year are Cassandra Azeredo-Tseng, from Worcester, Massachusetts, who is studying mathematical modeling of cellular signal adaptation and robustness in the yeast mating response pathway; and Melissa Simmons, of Trenton, New Jersey, who is researching gene editing for c. Elegans using plasmids. The requirements for Isermann medalists include admission to New College, first-time in-college status, status as an out-of-state resident for tuition purposes, a strong record of achievement in math and science in high school, and a strong interest in pursuing an undergraduate degree in mathematics or the natural sciences. The scholarship program is the result of the generosity of Sarasota residents Howard and Betty Isermann. Howard Iserman, the former chair of the New College Foundation Board of Trustees, has long recognized the importance of fostering out-of-state scholars. The Isermann’s generous endowments gifts have funded various academic initiatives and scholarships, and the construction of the Betty Isermann Fine Arts Building, a teaching facility and gallery on the Caples campus. Read more about the Isermann Medal Program here.